We have been informed that Comrade Arzu Cerkezoglu, President of the Confederation of Progressive Trade Unions of Turkey, has recently been tried and is facing a three-year prison sentence for a speech she gave during a panel discussion organised by Turkey’s main opposition party, CHP, in June 2016. In her speech, Comrade Arzu had criticised certain aspects of the policies of the current government in Turkey. The content and tone of her address should come as no surprise to anyone. The current economic crisis engulfing Turkey is an issue that most people inside and outside the country are aware of. Over recent years, Erdogan’s AKP government has pursued openly neoliberal policies that have brought chaos to the economic and social life of the country. The by-product of the government policies has manifested itself in increased repression over progressive forces and in particular trade unions, with many trade unionists having spent – and still spending – time in prison because of their fight for justice and their righteous demands. We are of the view that the charging and sentencing against Comrade Arzu Cerkezoglu is part of this same pattern. She has committed no crime except for defending the interests of workers and that is why she is being tried and sentenced to imprisonment. The Union of Metalworkers and Mechanics of Iran (UMMI), while expressing its solidarity with Comrade Arzu Cerkezoglu and the Confederation of Progressive Trade Unions of Turkey (DISK) as well as the working class of Turkey, hopes that the campaign in defence of Comrade Arzu by DISK – both nationally and internationally – will result in her successful appeal against the sentence and the guaranteeing of her freedom. Long live the working class internationally! 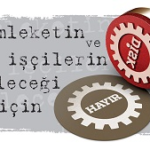 Forwards to the widening of the bonds of solidarity between the workers in Iran and Turkey!